I was in Sri Lanka a couple of weeks ago and had the opportunity to travel through Bandarawela, a unique destination for eco-tourists. Even during the colonial period Bandarawela with its semi-temperate climate was the main holiday destination for the foreign masters. Its reputation as a relaxing holiday resort in beautiful Sri Lanka still remains undiminished. What a paradise? However, I was shocked to see the irreparable damage caused to the town’s water supply by the so called Uma Oya project – a project politically motivated, dubiously designed and hastily executed by the former regime. Although the economic motive was to divert water from the Uma Oya and Kirindi Oya rivers to the dry lands in Hambantota, the birth place of the former president, a lack of proper assessment of the project’s side effects has proved disastrous to Bandarawela. There is nothing wrong in irrigating lands in the dry zone with excess water available in other parts of the country. In the medieval times Sri Lanka was a shining example of a hydraulic civilization. But mega irrigation projects should be designed in the light of a strict cost-benefit analysis. The cost should include not only the financial cost but also, and more importantly, the environmental cost. Just because a foreign country, and in this case Iran, has agreed to fund the project it should not be undertaken without proper feasibility study. The callous indifference shown towards the environment by the Uma Oya project has not only deprived Bandarawela of its natural water supply but also has caused structural damage to thousands of residential and commercial buildings. Substandard engineering work is definitely to be blamed. But ultimately the buck stops with the government in power. I was visiting a house in the town, which is more than one hundred years old and occupied by an acting judge. It was actually more than a house and resembled a magnificent repository for some rare legal records systematically arranged and displayed. The building and its contents are of immense historical value. Shockingly, the floor of the house, its walls and ceilings are all cracked and even the bed room of the occupants is massively damaged. They were not just hair line cracks which could be patched up but massive cleavages threatening total collapse at any time. This seems to be the fate of hundreds of other houses and buildings, new and old. The current government, although is not directly responsible to this disaster, is nevertheless answerable to the Bandarawela citizens. One should not forget that President Maithripala Sirisena was also a senior member of the Rajapaksa cabinet. Environmental neglect, when designing and executing megaprojects in the name of development, and the consequent damage caused by such projects to individuals, families and buildings cannot be ignored simply by throwing a few million rupees as compensation to the victims. Restoring Bandarawela’s water supply and rebuilding the damaged structures will certainly involve substantial outlays. Will the authorities provide proper justice to the victims of this town? In a regime where the independence of judiciary is not guaranteed it is doubtful whether the citizens of Bandarawela will receive adequate compensation from the politicians. Like the ‘Garbage Debacle’ the Uma Oya disaster is also man-made and demand class action. I’m a guy who was born in Bandrawela and has lived all my life here. A last it looks as though the rest of the country is waking up to what’s been happening here. It began about seven or eight years ago, but it may be that even we were complacent to start with. There are some absolutely urgent questions that must be addressed by the government. This is one. The situation in the North, where the local population is losing faith in this government ever having the courage to ring in the necessary constitutional changes is another. Then there is this Bond Scam business. Much trickier would be investigating the end of the war, but I feel that it is necessary. Also, investigating some of those High Profile murders, for which I feel that there appears to be sufficient evidence. And, since you are probably a Muslim, may I add, reform of MMDA. Please forgive me for lumping all these together! I will comment further on what I know at first hand. Having stated that, may I suggest that politicians stop making such a fuss about SAITM would help us focus on what is essential. SAITM, Petroleum Tank Farms, Reclaiming Land near the Colombo Harbour – these are issues on which we should keep an open mind. There are arguments on both sides. The public interest seen in the implications of the Uma Oya project was much weaker than in the Harbour City. Arguments are there for both sides on nearly every matter. Once well informed, one has to be decisive, as there can be no middle ground between good and bad or true and false or right and wrong. Many things have been done to serve narrow interests, knowing well the broader harmful implications. I suspect that there was awareness of the risks involved when the Uma Oya project was undertaken. I’m tired now, but I will try to follow up with comments in a day or two, especially if other commenters also have contributed new perspectives on the Uma Oya Project. I had got a longer post ready, but lost it owing to a technical hitch. I’ve lived all my life in Bandarawela and greatly appreciate your unbiased assessment. This is a very serious issue. The problem is our Rulers never pay their attention satisfactory to such important issues.I do not know whether they do not feel.There are very serious issues in this country. I do not know why Rulers cannot feel the NEED OF THE HOUR. I feel today they are preoccupied. Class action is somewhat unknown in Lanka. Class action against Uma Oya Project (or disaster?) will be too massive. Another “disaster” of comparable magnitude is the Noratcholai power plant. We think of it only during power cuts – frequent by the way. How about SriLankan Airlines? In other words almost all our mega projects including the one about to happen – the Mega-polis or whatever. How about trying out class action in the garbage collapse? Unfortunately activists like Nagananda Kodithuvakku have their hands full. There is an urgent need to educate Lankans about Uma Oya project. Thanks Ameer Ali for bringing this up. We need details please. Will the one and only Wimal speak up? How many trees have been destroyed without any proper permitt? Or licences? How acres of land forest have been destroyed?.. How many building have been built without proper planning?.wait and see more flood and more landslide ? More destruction? 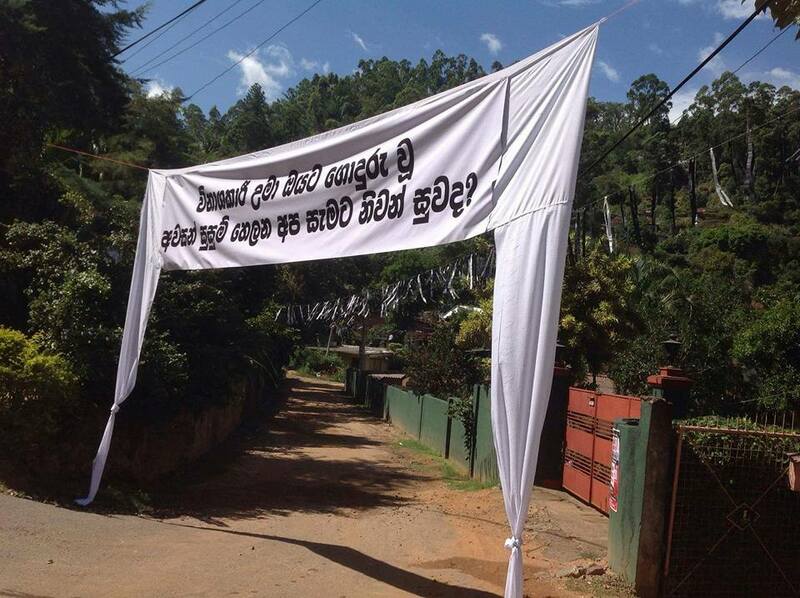 I live in UK and I love SL but I hate politicians of SL . No head for them . No respect for beauty of Sri Lanka..
Class actions are an American innovation, perhaps unknown to Sri Lankan and Indian and even UK or Australian law. But, there have been instances of a large number of plaintiffs bringing actions before the SL courts. The Eppawela Phosphate Case is an example. There is a need to use the courts in an innovative fashion. Perhaps, the Uma Oya case provides an opportunity. Dr Ali is to be congratulated in bringing such issues to the limelight. I’m a bit disappointed that Dr. Ameer Ali’s article has not been commented on more, but it’s not so surprising. It’s only those who suffer who realise how bad things can get for them. At least this article led me to find out something about the author, and I’m so happy that there are people like him who are so consistently good. Particularly when, all too often, we operate using national, ethnic, and religious stereotypes. The issue has received a good deal of attention already. The effect on me has not been too serious, yet. It is those who reside a crow-flying two miles South-East of my home who have been worst affected. If they do indeed continue with the tunnelling it will go almost directly beneath the Aislaby Tea Factory. It will then have to go within about a kilometer East of the S. Thomas’ School; my home is 300 meters further. This may give some of you an idea of the area affected. And now, of course, it is the period of the Annual Drought, so the next three months will definitely see the situation aggravating. Let’s hope that because there is an increased awareness of the threats, greater care is taken to minimise further damage. It’s sad that when this all began we focussed on the two ends of the tunnel, not realising that our entire town was going to be affected. When I said I’m a bit disappointed that there weren’t many comments on this article, I forgot to thank the Jaffna folk who have made quite a few comments.